After outscoring opponents 20-4 in its past three games, St. Louis continued its winning ways with a 5-4 victory in shootout despite an early deficit. In the first period, Carolina’s Ryan Murphy rocketed a slap shot high off the glass behind Brian Elliott. The puck wrapped around the boards to Victor Rask who took a slap shot from the blue line that deflected off the skate of Chris Butler into the net. The goal made it 1-0 with just two minutes gone in the first period. 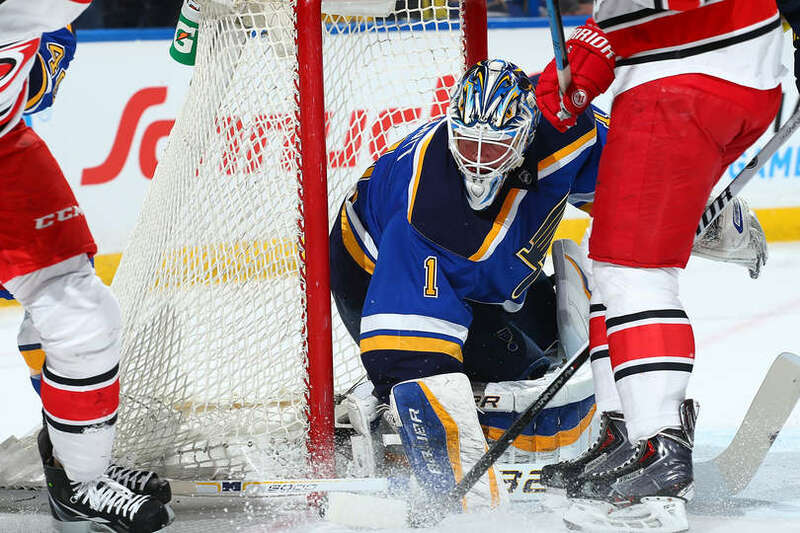 Later in the period, the Blues responded as Backes took a shot from the goal line off the pads of Cam Ward. The rebound bounced right to Alexendar Steen as he fired his 12th goal of the season to tie the game at one with 13:39 remaining in the period. Despite the goal by Steen, Elliott looked shaky in net as Carolina would retake the lead shortly after. A puck battle near the blue line in the Blues’ defensive zone led to the puck squirting out to the middle of ice. Jeff Skinner gained possession of the puck and wristed a shot past the glove of Elliott for his 10th goal of the season to make it 2-1. Just over five minutes later, a pass by Backes went past two Blues players and out of the offensive zone. The puck went right to Carolina captain Eric Staal as he took the puck in stride. Kevin Shattenkirk turned and slipped allowing Staal to go in on a breakaway. Staal deked past Elliott and scored to make it 3-1 with 7:18 remaining in the period. That would be all she wrote for Elliott as he was pulled for Jake Allen. Elliott posted just seven saves on 10 shots with three goals allowed. Headed into the game, Carolina ranked 29th in the NHL in goals scored per game, but the Hurricanes were able to tally three in the first period. However, with Allen in the game, things began to turn around in the second period for the Blues. Just over four minutes into the second period, it was Staal making the mistakes in his own end as he flipped the puck into the air towards the middle of the ice. The puck was gloved down by Jaden Schwartz, and Schwartz faked the shot getting Ward to go the ice before he put the puck in the net far side. The goal was Schwartz’s 14th of the season and brought the Blues within one. The Carolina lead evaporated under a minute later as the Blues developed a cycle down low in the offensive zone. The puck found its way to Backes as he slid it to Patrik Berglund. Berglund took a low wrist shot on net that made its way into the back of the goal as Ward never saw the shot go off due to the screen in front by Steen. The momentum continued with the Blues for the rest of the period, but Carolina answered back at the end of the period as Riley Nash put home a bouncing puck among a crowd of players in front of Allen. The goal was Nash’s 7th of the season and gave Carolina the lead headed into the second intermission. Just hours after being announced to his first career All-Star game along with teammate Kevin Shattenkirk, Vladamir Tarasenko scored his 23rd goal of the season. A long pass from his All-Star partner Shattenkirk sent Tarasenko into the offensive zone. Tarasenko twisted his way past Tim Gleason and burst to the net. The Russian winger shot and scored on the rebound to tie the game at four with 13:14 remaining in the final 20 minutes of regulation. The score would hold through three periods of play. In overtime, the Blues carried the puck into the offensive zone. A pass to Jori Lehtera was knocked down and sent back to Jay Bouwmeester. Bouwmeester fired a shot that beat Ward to for the goal. However, on the play, Berglund made contact with Ward’s left skate, and the goal was disallowed with the face off coming outside the attacking zone. Five minutes of overtime play proved not to be enough in this one as the game would head to a shootout still tied at four. In the first round, Oshie once again scored and was the only St. Louis player to score in the shootout. However, that would be all it would take as Allen stopped all three attempts to give the Blues the 5-4 win. Since coming into the game to replace Elliott, Allen made 19 saves on 20 shots to pick up his first win since Dec. 16. With the win, St. Louis improves to 25-13-3 with 53 points keeping them in third place in the Central Division. St. Louis will return to the ice Tuesday Jan. 13 at the Scottrade Center against the league-worst Edmonton Oilers at 7 p.m. CT.
Is this the best line in hockey?